Make these super cute frozen banana treats with your kids this weekend! Healthy and naturally gluten free. You know in the coming weeks they will be ingesting more sweets than usual, so take the opportunity to make a few healthier treats. This is such an easy and fun Halloween DIY goody, one that your kids will really enjoy making as well. Being gluten free does not mean missing out on fun Halloween activities and treats. These are dairy free as well! Woot woot! *I’m sure these would also turn out well dipped in a white chocolate glaze, as an alternative if you do not have coconut oil on hand. Peel bananas, and cut in half. Place popsicle stick in each half, lay bananas on a lined tray and freeze for at least 30 minutes uncovered. Fill a dish of some sort, that will fit in your freezer (like a bread pan) with dried beans/rice. Melt together coconut oil and honey. Whisk well to combine. Remove frozen bananas and dip into the honey coconut glaze- you could also hold it over the bowl and spoon the glaze onto the bananas. Whatever is easiest for you, just be sure to fully coat the banana. Hold it upside down for a second, allowing any excess glaze to drip off. In between coating each banana, whisk the glaze and you may need to reheat it if starts to thicken. Place banana pops in the freezer, in your bean stand or if you aren’t looking for perfection you can just lay them back on your parchment lined tray. Meanwhile, melt the chocolate. 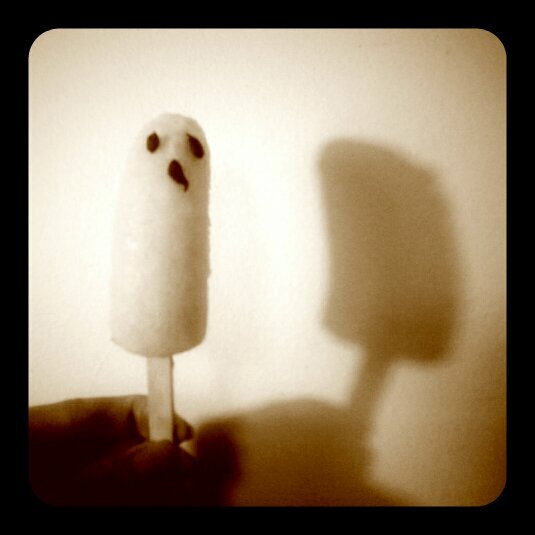 Spoon it into a ziplock bag, cut off a tiny hole in the corner and make your ghost faces on each popsicle. To make this more kid friendly, give them each a small bowl of melted chocolate and let them use toothpicks to apply silly faces. The chocolate will harden right away, and if mistakes are made, it just comes right off! Display your frozen ghost pops in a glass dish filled with dried beans. Enjoy! 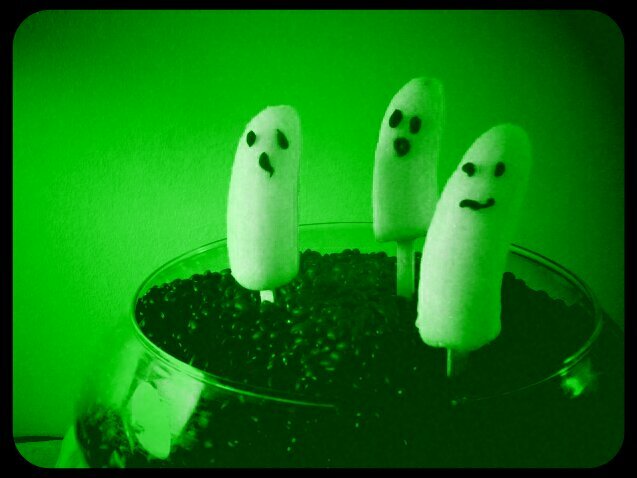 Because of the honey coconut glaze, these banana pops will not turn brown and will remain looking “ghostly” white. Make these ahead of time for an allergen friendly Halloween treat.